Yesterday, as I drove to work the sun shone brightly, a change from earlier days in the week. The changing leaves almost sparkled as the sun bounced off of them. It was a crisp autumn morning with a real chill in the air. The cold air made me shiver, but looking at the sun warmed me. It was the kind of morning that made me want to belt out worship music at the top of my lungs because everywhere I looked displayed God's splendor. I already had one of my favorite albums in the cd player, an album from the church where I met my husband. The opening track is O For a Glance of Heavenly Day and it just fit the day perfectly. As I drove, I thought about how the lyrics spoke to my own frozen heart. As I had walked to my car, I noticed frost covered leaves in the yard and there was a thin layer of frost on my windshield. Those leaves were a reminder of the state of my heart. The song paints a picture of my heart, similar to those leaves. My heart is prone to freeze over with the many demands of the day and I go to bed weary. Each morning, it needs to be thawed, just as frost-covered leaves will be by the sun as the day goes on and the ground heats up. About the time I was making the connection between the condition of my heart apart from Christ, and the frost-covered leaves, a school bus stopped in front of me by a cemetery. I always think how pretty the setting is with its large oaks. Despite cemeteries often being considered morbid places, this one is full of large trees with glorious autumn colors. 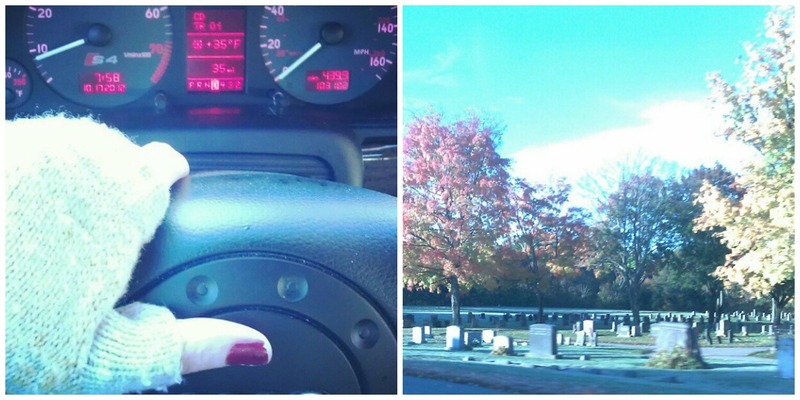 I flashed back to my childhood when I drove by a cemetery with my mom and recalled her view on them. I remember how she told me they don't have to be sad places and I would never have to visit her grave since she wouldn't be there. She was right, I don't have to visit her grave because she's been experiencing heavenly days for eleven years and for just a moment every now and then I get a glimpse of what heaven may be like by experiencing God's grace day after day as He thaws my calloused heart. ah i am so the same way. i go to bed weary and wornout from everything... i come home, burden laden. but sometimes little things like this are such beautiful reminders of God. two days ago, it was a rough day at work and I just didn't want to be there. I went on my usual lunchtime run and as I ran along the pier, I was just struck by the INSANE beauty around me. the weather was perfect-- 60 degrees-- and as I stopped at the water to watch the waves, I thanked God for everything. In that perfect moment, I saw a fish jump. It was incredible. And I was just struck by the little moments that God is so faithful in. Can I let you in on a secret? I have a calloused heart too. And right now I feel God chipping away at it, breaking it. And yet I still fall in love with Him. what a beautiful reflective post. don't you love those moments when God speaks to you through music and metaphors and there's just no denying he's speaking to you? my heart definitely needs some softening right now as well, especially when it comes to situations at work. i have tears streaming down my face right now. i'm coming up on 10 years of my mom's passing and i often feel guilty that she is buried so far away and that i can't visit her more often - but you're so right. she's not there, she's in heaven celebrating life and love. thank you, beth!